Destin, 41, father of 5 children. With his family, Destin fled an attack against his village in 2014. “We fled and hid in the bush. 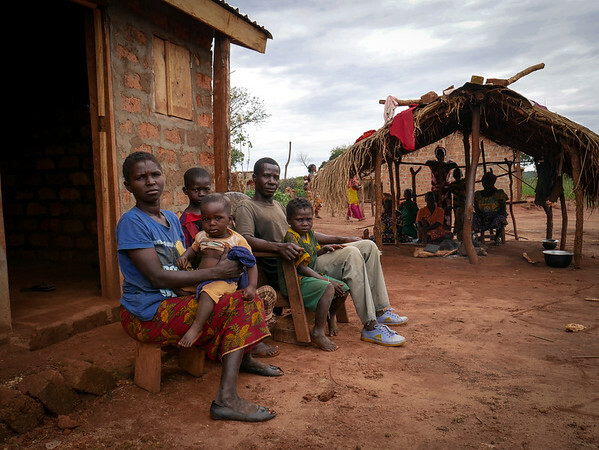 We lived like animals for two years in the bush” says Destin, a displaced from Zaire, a village located about 100km from Carnot, western Central African Republic. “We didn’t take any bag with us. We just fled. They killed 5 persons of our village including my aunt. She was shot three times; one to her neck, one to her chest, and another one to her lower abdomen. “I had not returned there but a few days after the attacks, neighbors who went back to check on their property found her body, swollen, in state of decomposition. They dug a hole and buried her there. “I could not distinguish if it was the Peuhls or anti-balaka militia that we firing at us. I don’t meddle into politics, I don’t carry weapons, I don’t know how to fight, so why did this happened to us? “It took us a year with my family to be reunited together in the bush. We fled in a scattered fashion, walked along the Mambéré River. “Every day was about survival. Each day I wondered whether I will die or live. Within the first months of our flight, we could still hear gunshots. I would turn around to make sure my wife and children weren’t shot by a stray bullet. “ we built a shelter made of tree leaves, straw and wooden sticks to sleep at night. “The women would return to the village to find out if there was anything left they could bring back to eat. They would also take whatever they find dans les champs. “After two years, fighting calmed and headed to Carnot. I found a home that was unoccupied. I just wanted to find a safe refuge for family until we could go somewhere else. I cleaned the house, put doors and windows on it. We lived there for another two years until the daughter of the owner of the house showed up. They had fled too and now intended to return. This was not my house and after mine was burned down, I understand too well the need to have a home. I promised the daughter that we would leave before they would returned. “One day, I was told about construction of homes to start. I volunteered to help clean the site and then I was allowed to build my little home. That’s how I ended up here. “After several years of living in fear and suffering, I am finally well with my family. There are still little struggles we face like not having enough food since we don’t have a sufficient and regular income but knowing that we don’t need to move again is a relief. NRC with funds from UNHCR secured a piece of land in the district PK5 , Carnot, on which IDPs who vacated homes of returnees could build a little home.